Recently, researchers have taken tremendous strides in attempting to synthesize conventional social judgments and automated filtering within recommender systems. 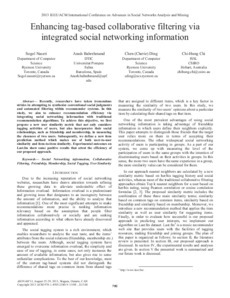 In this study, we aim to enhance recommendation efficiency via integrating social networking information with traditional recommendation algorithms. To achieve this objective, we first propose a new user similarity metric that not only considers tagging activities of users, but also incorporates their social relationships, such as friendship and membership, in measuring the closeness of two users. Subsequently, we define a new item prediction method which makes use of both user-to-user similarity and item-to-item similarity. Experimental outcomes on Last.fm show some positive results that attest the efficiency of our proposed approach.